PERSEPHONE was the queen of the underworld and the goddess of spring growth. This page contains descriptions of her various divine functions, her sacred plants and animals, and a list of titles and epithets. "I begin to sing of rich-haired Demeter, awful goddess, of her and of her daughter lovely Persephone." "Hymn to Phersephone. Daughter of Zeus, Persephone divine, come, blessed queen, and to these rites incline: only-befotten, Plouton's [Haides'] honoured wife, O venerable Goddess, source of life: 'tis thine in earth's profundities to dwell, fast by the wide and dismal gates of hell. Zeus' holy offspring, of a beauteous mien, Praxidike (Avenging-Goddess), subterranean queen. The Eumenides' [Erinyes'] source, fair-haired, whose frame proceeds from Zeus' ineffable and secret seeds. Mother of Eubouleos [Dionysos-Zagreos], sonorous, divine, and many-formed, the parent of the vine. Associate of the Horai (Seasons), essence bright, all-ruling virgin, bearing heavenly light. With fruits abounding, of a bounteous mind, horned, and alone desired by those of mortal kind. O vernal queen, whom grassy plains delight, sweet to the smell, and pleasing to the sight : whose holy form in budding fruits we view, earth's vigorous offspring of a various hue : espoused in autumn, life and death alone to wretched mortals from thy power is known : for thine the task , according to thy will, life to produce, and all that lives to kill. Hear, blessed Goddess, send a rich increase of various fruits from earth, with lovely peace : send health with gentle hand, and crown my life with blest abundance, free from noisy strife; last in extreme old age the prey of death, dismiss me willing to the realms beneath, to thy fair palace and the blissful plains where happy spirits dwell, and Plouton [Haides] reigns." "Sing of Demeter, ruler of corn-rich Sikelia (Sicily), and of the violet-garlanded Koure (Core) [Persephone]." "I sing of the mother of Ploutos (Plutus, Wealth), Demeter Olympia, in the garland-wearing season, and of you, Persephone, child of Zeus: greetings, both! Tend the city well." Persephone was the queen of the land of the dead. This section contains general references to this role. More specific aspects are detailed in the sections which follow. "There, in front [of the ends of the earth], stand the echoing halls of the god of the lower-world, strong Haides, and of awful Persephone. A fearful hound [Kerberos (Cerberus)] guards the house in front . . . keeps watch and devours whomsoever he catches going out of the gates of strong Haides and awful Persephone." "Then let Ekho (Echo) speed to Persephone's dark-walled dwelling, to his [deceased] father Kleodemos bearing the glorious tidings." "For these Akhilleus' (Achilles') hand pointed the way down to Persephone's abode [i.e. he killed them]." "She died before her marriage and was received by the dark chamber of Persephone." "Persephone who impairs the mind of mortals and brings them forgetfulness. No one else has ever contrived this, once death's dark cloud has enveloped him and he has come to the shadowy place of the dead and passed the black gates which hold back the souls of the dead, for all their protestations." "No man, once the earth has covered him and he has gone down into the darkness, the home of Persephone, has the pleasure of listening to the lure or piper or of raising to his lips the gift of Dionysos [i.e. wine]." "The Incompetent Doctor . . . The patient said [to the incompetent doctor], 'They [the shades of Haides] are taking it easy, drinking the water of Lethe. But Persephone and the mighty god Plouton [Haides] were just now threatening terrible things against all the doctors, since they keep the sick people from dying. Every single doctor was denounced, and they were ready to put you at the top of the list. This scared me, so I immediately stepped forward and grasped their royal sceptres as I solemnly swore that this was simply a ridiculous accusation, since you are not really a doctor at all." Sokrates : Let us inquire what thought men had in giving them [the gods] their names . . . The first men who gave names [to the gods] were no ordinary persons, but high thinkers and great talkers . . . Pherephatta [Persephone]!--How many people fear this name, and also Apollon! I imagine it is because they do not know about correctness of names. You see they change the name to Phersephone and its aspect frightens them. But really the name indicates that the goddess is wise;for since things are in motion (pheromena), that which grasps (ephaptomenon) and touches (epaphôn) and is able to follow them is wisdom. Pherepapha, or something of that sort, would therefore be the correct name of the goddess, because she is wise and touches that which is in motion (epaphê tou pheromenou)--and this is the reason why Haides, who is wise, consorts with her, because she is wise--but people have altered her name, attaching more importance to euphony than to truth, and they call her Pherephatta." "[Persephone] the spouse of Klymenos (the Famous One) [i.e. Haides], host of many (polyzeinos)." "[Hermes] who constant wanderest through the sacred seats where Haides' dread empress, Persephone, retreats; to wretched souls the leader of the way, when fate decrees, to regions void of day . . . for Persephone, through Tartaros dark and wide, gave thee for ever flowing souls to guide." "Ethemea, of the race of Nymphae (Nymphs), who was stuck with the arrows of Diana [Artemis] when she ceased worshipping her. At last she was snatched away alive by Proserpina [Persephone] to the Land of the Dead." "Driven headlong to the depths, bold to tread ways irretraceable, dist thou see Sicilian Proserpina's [Persephone's] realms?" "All the world's holy powers, and thou [Haides] who rulest the all-holding realm, and thou [Prosperina-Persephone] whom, stolen from Enna, thy mother [Ceres-Demeter] sought in vain, may it be right, I pray, boldly to speak of powers hidden away and buried beneath the earth." "Let the heavens hear his mighty groans, let the queen of the dark world [Proserpina-Persephone] hear, and fierce Cerberus, crouching in his lowest cave . . . let Chaos re-echo the outcries of his grief." "Upon the Stygian shores . . . not yet had the Eumenis [Erinys] met and purified him [the new dead ghost] with branch of yew, not had Proserpine [Persephone] marked him on the dusky door-post as admitted to the company of the dead." "Tis the seventh day [after death], and already those eyes are dull and cold, and Juno of the Underworld [Proserpina-Persephone] hath clasped him and seized in her hand the lock of hair." "[Isis in the guise of Persephone speaks :] ‘I , whom you now behold, shine brightly in the darkness of Acheron and reign in the inner Stygian depths.’"
"He [the corrupt physician] made a pretence of dispending the celebrated potion called by more learned people ‘The Health Offering' (Salus Sacra), a drug necessary for easing gastric pains and dissolving bile; but in its place he substituted another draught, ‘The Death Offering’ (Proserpina Sacra) [i.e. a draught of poison]." "I will pass even to Akheron the River of Pain of my own free will, and with rapture even amid the many lamentations of all-forgetting Lethe, I will tell the dead of my fate, to awaken pity and envy alike in merciless Persephoneia." "[Dionysos transforms his dead friend Ampelos into a grape-vine :] ‘For you Haides himself has become merciful, for you Persephone herself has changed her hard temper, and saved you alive in death for brother Bakkhos (Bacchus). You did not die . . . You are still alive, my boy, even if you died.’"
See ALSO other related sections on this page. The Mysteries of the goddesses Demeter and Persephone promised initiates passage to a blessed afterlife. "[After the return of Persephone from the underworld :] Rich-crowned Demeter . . . straightway made fruit to spring up from the rich lands, so that the whole wide earth was laden with leaves and flowers. Then she went, and to the princes [of Eleusis] who deal justice, Triptolemos and Diokles, the horse-driver, and to doughty Eumolpos and Keleus (Celeus), leader of the people, she showed the conduct of her rites and taught them all her Mysteries, to Triptolemos and Polyxeinos and Diokles also,--awful Mysteries which no one may in any way transgress or pry into or utter, for deep awe of the gods checks the voice. Happy is he among men upon earth who has seen these mysteries; but he who is uninitiate and who has no part in them, never has lot of like good things once he is dead [i.e. passage to Elysion], down in the darkness and gloom." "But, as for those from whom Persephone shall exact the penalty of their pristine woe, in the ninth year she once more restoreth their souls to the upper sun-light; and from these come into being august monarchs, and men who are swift in strength and supreme in wisdom; and, for all future time, men call them sainted heroes." "Blessed is he who hath seen these things [i.e. the Eleusinian Mysteries] before he goeth beneath the hollow earth; for he understandeth the end of mortal life, and the beginning of a new life given of god." "For them [in Elysion (Elysium)] the sun shineth in his strength, in the world below, while here 'tis night; and, in meadows red with roses, the space before their city is shaded by the incense-tree, and is laden with golden fruits. Some of them delight themselves with horses and with wrestling; others with draughts, and with lures; while beside them bloometh the fair flower of perfect bliss. And o'er that lovely land fragrance is ever shed, while they mingle all manner of incense with the far-shining fire on the altar of the gods. From the other side sluggish streams of darksome night belch forth a boundless gloom." "Sokrates : There were certain priests and priestesses who have studied so as to be able to give a reasoned account of their ministry [i.e. the priests of the Mysteries]; and Pindar also and many another poet of heavenly gifts. As to their words, they are these : mark now, if you judge them to be true. They say that the soul of man is immortal, and at one time comes to an end, which is called dying, and at another is born again, but never perishes. Consequently one ought to live all one's life in the utmost holiness. ‘For from whomsoever Persephone shall accept requital for ancient wrong, the souls of these she restores in the ninth year to the upper sun again [i.e. reincarnation]; from them arise glorious kings and men of splendid might and surpassing wisdom, and for all remaining time are they called holy heroes amongst mankind.’"
"Whenever a shade approaches that has won the praise of a loving spouse, Proserpine [Persephone] bids summon joyful torches, and the heroines of old come forth from hallowed bowers and scatter the shades of gloom in radiant light, and strew garlands and Elysian flowers before her." "[Isis in the guise of Persephone speaks :] ‘You will dwell in the Elysian fields, while I, whom you now behold, shine brightly in the darkness of Acheron and reign in the inner Stygian depths.’"
Haides and Persephone presided over the oracles of the dead and the rites of necromancy (nekromankia)--summoning and communion with the ghosts of the dead. 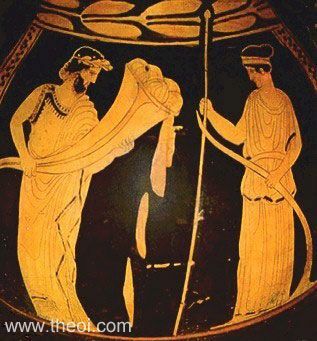 Odysseus was instructed in necromancy by the witch Kirke (Circe) so that he might commune with the prophetic ghost of the seer Teiresias. According to the author of the Odyssey the rites were performed on the border of the underworld. Later authors, however, say that Odysseus visited the Nekromanteion (Oracle of the Dead) at Cumae in southern Italy or Thesprotia in western Greece. ‘And when you have sailed through the river Okeanos (Oceanus), you will see before you a marrow strand and he groves that are Persephone's--the tall black poplars, the willows with their self-wasted fruit; then beach the vessel beside deep-eddying Okeanos and pass on foot to the dank domains of Haides. At the entrance there, the stream of Akheron (Acheron) is joined by the waters of Pyriphlegethon and a branch of Styx, Kokytos (Cocytus), and there is a rock where the two loud-roaring rivers meet. Then, lord Odysseus, you must do as I enjoin you; go forward, and dig a trench a cubit long and a cubit broad; go round this trench, pouring libation for all the dead, first with milk and honey, then with sweet wine, then with water; and sprinkle white barley-meal above. Then with earnest prayers to the strengthless presences of the dead you must promise that when you have come to Ithaka (Ithaca) you will sacrifice in your palace a calfless heifer, the best you have, and will load a pyre with precious things; and that for Teiresias and no other you will slay, apart, a ram that is black all over, the choicest in all the flocks of Ithaka. "[Odysseus travels to the underworld to consult the ghost of the seer Teiresias :] The vessel came to the bounds of eddying Okeanos (Oceanus), where lie the land and city of the Kimmeroi (Cimmerians), covered with mist and cloud. never does the resplendent sun look on this people with his beams . . . dismal gloom overhangs these wretches always. Arriving there, we beached the vessel, took out the sheep and then walked onwards beside the stream of Okeanos until we came to the place that Kirke (Circe) had told us of. Meanwhile there appeared [before Odysseus] a whole company of women, sent by Persephone the august; and these were the wives or the daughters of great men. They gathered flocking round the dark blood [of the sacrificial black sheep] all together. So they came forward one after another, and each in turn told me her lineage, for I left none of them unquestioned . . .
Then, when chaste Persephone had dispersed this way and that the souls of those many women, there came before me in bitter sorrow the soul of Agamemon . . . Then there came before me the soulds of Akhilleus (Achilles) and Patroklos (Patroclus) , of noble Antilokhos (Antilochus) and of Aias (Ajax) . . . and the soul of the fleet-foot son of Peleus went pacing forth over the field of asphodel . . . Other souls of the dead and gone still stood there sorrowfully, each of them questioning me on whatever touched them the most . . . Indeed I might then have seen [more of] those men of past days I wished to see, but before I could, there came before me with hideous clamour the thronging multitudes of the dead, and ashly terror seized hold of me. I feared that august Persephone might send against me from Haides' house the Gorgoneion (gorgon's head) of some grisly monster. I made for my ship at once, telling my comrades to step aboard and to loose the cables." [Upon returning to Ithaka Odysseus slew the suitors :] After sacrificing to Haides, and Persephone, and Teiresias, he journeyed on foot through Epeiros (Epirus), and came to the Thesprotians, and having offered sacrifice according to the directions of the soothsayer Teiresias, he propitiated Poseidon." The Cumaean Sibyl guided Aeneas through the underworld by means of the Oracle of the Dead near Cumae. Virgil's account is only quoted in part here. She showed him in the glade of Juno Averna [Persephone] a gleaming golden bough and bade him break it from the trunk. Aeneas did her bidding and saw the riches of Orcus' [Haides'] frightful realm and his own ancestors and the aged ghost of great-hearted Anchises." "[The Cumaean Sibyl instructs Aeneas in the rites of necromancy :] ‘Between, there lies a forest, and darkly winds the river Cocytus round the place. But if so great your love is, so great your passion to cross the Stygian waters twice and twice behold black Tartarus, if your heart is set on this fantastic project, here's what you must do first. Concealed in a tree's thick shade there is a golden bough--gold the leaves and the tough stem--held sacred to Proserpine [Persephone] : the whole wood hides this bough and a dell walls it round as it were in a vault of shadow. Yet none is allowed to enter the land which earth conceals save and until he has plucked that gold-foil bough from the tree. Fair Proserpine ordains that it should be brought to her as tribute. When a bough is torn away, another gold one grows in its place with leaves of the same metal. So keep your eyes roving above you, and when you have found the bough just pull it out : that branch will come away quite easily if destiny means you to go; otherwise no amount of brute force will get it, nor hard steel avail to hew it away.’"
In Statius' Thebaid the seer Teiresias performs necromancy to commune with the dead to discover the cause of a curse-plague afflicting the city of Thebes. "He [the seer Tiresias] prepares the rites of Lethe [i.e. Nekromankia], and makes ready beforehand to evoke the monarch [Haides] sunk below the confines of [the Theban river] Ismenos where it mingles with the deep, and makes purgation all around with the torn entrails of sheep and the strong smell of sulphur, and with fresh herbs and the long mutterings of prayer . . . [Tiresias] bids the dark-fleeced sheep and black oxen be set before him . . . Then he entwined their fierce horns with wreaths of dusky hue, handling them himself, and first at the edge of that well-known wood [i.e. one sacred to the goddess Hecate] he nine times spills the lavish draughts of Bacchus into a hollowed trench, and gifts of vernal milk and Attic rain [i.e. honey] and propitiatory blood to the Shades below; so much is poured out as the dry earth will drink. Then they roll tree trunks thither, and the sad priest bids there be three altar-fires for Hecate and three for the maidens born of cursed Acheron [i.e. the Erinyes]; for thee, lord of Avernus [Haides], a heap of pinewood though sunk into the ground yet towers high into the air; next to this an altar of lesser bulk is raised to Ceres of the Underworld [i.e. Persephone]; in front and on every side the cypress of lamentation intertwines them. And now, their lofty heads marked with the sword and the pure sprinkled meal, the cattle fell under the stroke; then the virgin Manto [the daughter of Tiresias], catching the blood in bowls, makes first libation, and moving thrice round all the pyres, as her holy sire commands, offers the half-dead tissues and yet living entrails, nor delays to set the devouring fire to the dark foliage. And when Tiresias heard the branches crackling in the flames and the grim piles roaring--for the burning heat surges before his face, and the fiery vapour fills the hollows of his eyes--he exclaimed, and the pyres trembled, and the flames cowered at his voice : ‘Abodes of Tartarus and awful realm of insatiable Mors (Death) [Thanatos], and thou, most cruel of the brothers [Haides], to whom the Shades are given to serve thee, and the eternal punishments of the damned obey thee, and the palace of the underworld, throw open in answer to my knowing the silent places and empty void of stern Persephone, and send forth the multitude that lurk in hollow night.’"
"[The blind seer Tiresias describes his visions as he performs the necromantic rites :] ‘Himself [lord Haides] I behold, all pale upon the throne, with Stygian Eumenides [Erinyes] ministering to his fell deeds about him, and the remorseless chambers and gloomy couch of Stygian Juno [Persephone].’"
"For the goddess Persephone sent up to them [the Argonauts] the mourning ghost of Aktor's son [who had died during the expedition of Herakles against the Amazones], who craved to see some men of his own kind, if only for a moment." Witches, such as Medea, were practitioners of the necromancy. Medea employs this chthonic power in a spell to restore Aeson's youth. "[Medea uses her magic to restore Aeson's youth :] Two turf altars she built [for the ritual], the right to Hecate, the left to Juventas (Youth) [Hebe], wreathed with the forest's mystic foliage, and dug two trenches in the ground beside and then performed her rites. Plunging a knife into a black sheep's throat she drenched the wide ditches with blood; next from a chalice poured a stream of wine and from a second chalice warm frothing milk and, chanting magic words, summoned the Deities of Earth (Numina Terrena) and prayed the sad shades' monarch (Rex Umbrarum) [Haides] and his stolen bride [Persephone] that, of their mercy, from old Aeson's frame they will not haste to steal the breath of life . . . [She then applied the potion to the body of Aeson] and Aeson woke and marvelled as he saw his prime restored of forty years before." The Oracle of the Dead (Nektromanteion) in Thesprotia was a shrine sacred to the netherworld gods Haides and Persephone. The oracles of the daimones Amphiaraus and Trophonios in Boiotia were also necromantic. Persephone was the mistress of the Erinyes (Furies)--underworld daimones who punished the crimes of filial betrayal, impiety and murder. She despatched them when curses were invoked in her name. "[Phoinix tells the tale of his curse :] ‘I first left Hellas . . . running from the hatred of Ormenos' son Amyntor, my father; who hated me for the sake of a fair-haired mistress. For he made love to her himself, and dishonoured his own wife, my mother; who was forever taking my knees and entreating me to lie with this mistress instead so that she would hate the old man. I was persuaded and did it; and my father when he heard of it straightway called down his curses, and invoked against me the dreaded Erinyes that I might never have any son born of my seed to dandle on my knees; and the divinities, Zeus Khthonios (of the Underworld) [i.e. Haides] and Persephone the honoured goddess, accomplished his curses.’"
"Orestes [prepares to slay the murderers of his father] : O Gaia (Earth), send up my father to watch my battle! Elektra : O Persephone, grant us indeed a glorious victory! Orestes : Father, remember the bath where you were robbed of life." "[Oidipous (Oedipus), who had blinded himself upon discovering that he had killed his father and married his mother, summons the Erinyes to punish his sons for their scornful treatment of him :] Oedipus with avenging hand probed deep his sinning eyes and sunk his guilty shame in eternal night . . . yet with unwearied wings the fierce daylight of the mind hovers around him, and the avenging Dirae [Erinyes] of his crimes assail his heart. Then he displays to heaven those empty orbs, the cruel, pitiful punishment of his own lie, and with blood-stained hands beats upon the hollow earth, and in dire accents utters this prayer : ‘Gods [Haides, Persephone and the Erinyes] who hold sway over guilty souls and over Tartarus crowded with the damned, and thou O Styx, whom I behold, ghastly in thy shadowy depths, and thou Tisiphone, so oft the object of my prayer, be favourable now, and further my unnatural wish . . . Sightless though I was and driven from my throne, my sons, on whatever couch begotten, attempted not to give me guidance or consolation in my grief . . . and they mock my blindness, they abhor their father's groans . . . Do thou at least, my due defender, come hither, and begin a work of vengeance that will blast their seed for ever!’"
"From her [the Erinys Tisiphone's] shoulders falls a stark and grisly robe, whose dark fastenings meet upon her breast : Atropos [one of the Moirai] and Proserpine [Persephone] fashion her this garb anew." "They [the Lemnian women] pledged their solemn word [to slay their husbands], and thou wast witness, Martian Enyo, and thou, Ceres of the Underworld [i.e. Proserpina-Persephone], and the Stygian goddesses [the Erinyes] came in answer to their prayers." "Upon the Stygian shores . . . not yet had the Eumenis [Erinys] met and purified him [the newly dead ghost] with branch of yew, not had Proserpine [Persephone ] marked him on the dusky door-post as admitted to the company of the dead." The whole mind of Persephoneia was perturbed while she spoke, babbling deceit as the false tears bedewed her cheeks. Goddess bowed assent to goddess, and gave her [the Erinys] Megaira to go with her, that with her evil eye she might fulfil the desire of Hera's jealous heart." 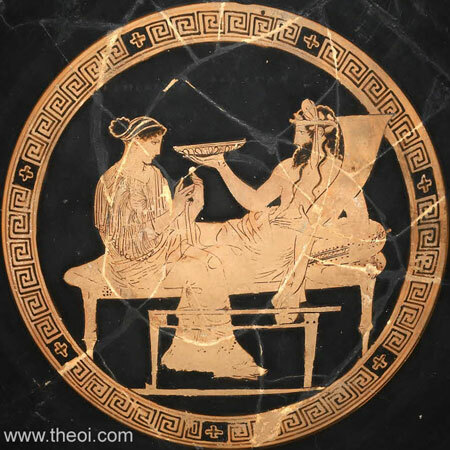 While Bakkhos (Bacchus) yet conversed with circling Mene (Moon), even then Persephone was arming her Erinyes for the pleasure of Dionysos Zagreus, and in wrath helping Dionysos his late born brother." 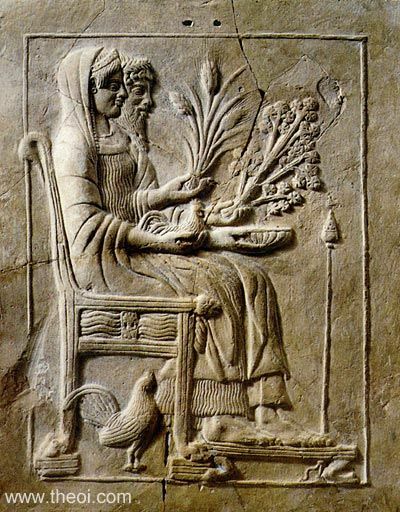 Persephone was the goddess of spring growth and more specifically of the sprouting of the grain seed. The earth flourished when she returned from the underworld each spring. "[Persephone] associate of the Horai (Seasons), essence bright, all-ruling virgin, bearing heavenly light. With fruits abounding, of a bounteous mind, horned, and alone desired by those of mortal kind. O vernal queen, whom grassy plains delight, sweet to the smell, and pleasing to the sight: whose holy form in budding fruits we view, earth's vigorous offspring of a various hue . . . Hear, blessed Goddess, send a rich increase of various fruits from earth." "[The Horai (Seasons)] attending Persephone, when back from night the Moirai (Fates) and Kharites (Charites, Graces) lead her up to light; when in a band harmonious they advance, and joyful found her form the solemn dance. With Mother [Demeter] triumphing, and Zeus divine, propitious come, and on our incense shine; give earth a store of blameless fruits to bear." The shades of the dead wandered the fields of asphodel in the underworld. It was a drab, ghostly-grey plant, edible but extremely bland. Haides is holding a sprig of asphodel in the bas-relief picture at the top of this page (image R14.1). "Asphodelos (Asphodel) : A bulbous plant, having long leaves and an edible stem; and its seed when roasted and the root chopped up with figs fetches a high price. [It is] sacred to Persephone and the underworld [deities]. Also Rhodians wreath Kore (Core) [Persephone] and Artemis with asphodel . . . But the place in which it grows must be pronounced oxytone, as in Homer : ‘over the asphodel meadow.’"
Persephone had a number of poetic and cultic titles and epithets. The Romans also had several titles for the goddess including Juno Inferna (Infernal Queen), Averna (Of the Underworld), Stygia (Of the Styx), and Cure (Kore). Greek Lyric III Lasus, Fragments - Greek Lyric C6th B.C. Greek Lyric V Scolia, Fragments - Greek Lyric B.C.